Grunge slouchy sweater, jumper, hand knit cozy, alpaca wool, long loose neckline, loose fit, pullover, cardigan, extra long sleeves. Perfect for wearing over a jumpsuit, jeans, leggings. Ultra soft warm wool sweater, you will want to wear every day! Size: Oversize, Plus Plus Size Length: 31.5" (80 cm) Bust: 60.0" (150 cm) Widht / Hip : 60.0" (150 cm) Made with care in a smoke free home. Easy care. Hand wash below 30*C, cold water with dry flat. Washing machine program: hand wash/wool, 30*C, cold water. Thank you for visiting my shop. If you have any questions I'll be happy to answer you. I airmail within 1-2 days after payment . Please allow about 3 weeks for Standard Shipping. 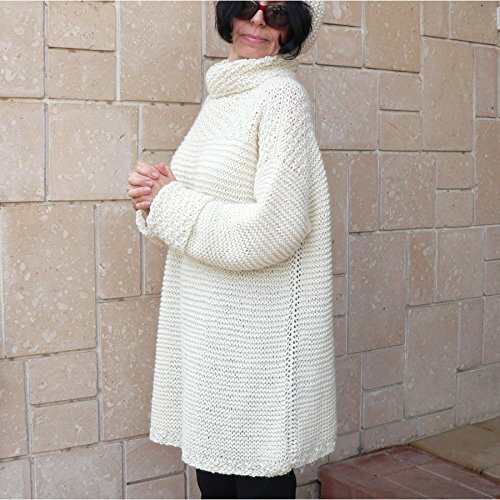 Kimono cut sweater , women's knitted sweaters,Pullover Sweater ,Mustard.